amphoterite (LL6) Witnessed Fall November 16th, 1492 1130 hrs. This meteorite is perhaps the most "famous" of the "historic falls" having occured in the very same year that Christopher Columbus "discovered" America! 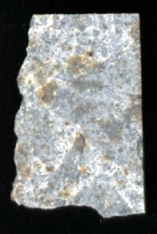 The Ensisheim meteorite is an excellent LL6 (Very Low Iron)Brecciated and veined. O.Richard Norton writes(see footnot below): "The Ensisheim meteorite is the oldest witnessed fall in the Western Hemisphere from which specimens are preserved..." About noon on that November day in 1492 , after a very loud explosion, a 280-pound stone meteorite did fall in a wheat field near the village of Ensisheim, in the province of Alsace, France.A young boy witnessed this fall and led the townsfolk into the field, where the meteorite lay in a hole 3 feet deep. Many of the museums around the world display a specimen of Ensisheim. A specimen about 122 pounds, almost without crust is on display in the town hall in Ensisheim.